From the Great White North of Canada, we jet set our way to the Republic of Cuba. We have to leave via Canada because no flights from the U.S. go to the communist country. Speaking of communism, it has been discovered that the government of the United States tried to assassinate Fidel Castro an estimated 638 times, as they opposed the dictator’s rule. Here are some of the craziest plans they drew up! We’ve all seen the famous exploding cigar cartoon gag and apparently the CIA thought it was a pretty good idea, too. Heck, if Bugs Bunny can make it work, why couldn’t they. Castro was known to have a love of cigars (Cuban, of course), so why not slip an explosive one into his collection and let him light his own ending. The CIA also had a plan for cigars contaminated with botulin to be given to Castro, showing smoking definitely can kill! As much as Castro loved his stogies, he also had a penchant for milkshakes, particularly the ones made at the Havana Hilton. Therefore, the CIA tried to poison his frosted treat. Apparently, the plan went awry when the deadly pill froze to the surface of where it was being held and when the would-be assassin tried to pry it loose, the capsule split and the poison was lost. According to longtime Castro bodyguard Fabian Escalante, this was the closest Castro came to meeting his maker. The Cuban Prime Minister was also an avid scuba diver and this factored into two attempts on his life. First, plans were hatched to give Castro a scuba suit infected with spores of tubercle bacilli. When that fell through, discussion turned to rigging a conch shell with explosives and placing it in one of the areas Castro frequented and favoured when diving. In their attempt to oust Castro from power, the CIA even turned to some of his many mistresses, hoping they would be vengeful enough to kill the Latin lover. One, Marita Lorenz, even smuggled poison capsules into Castro’s bedroom, but they dissolved in the jar of cold cream they had been stashed in. 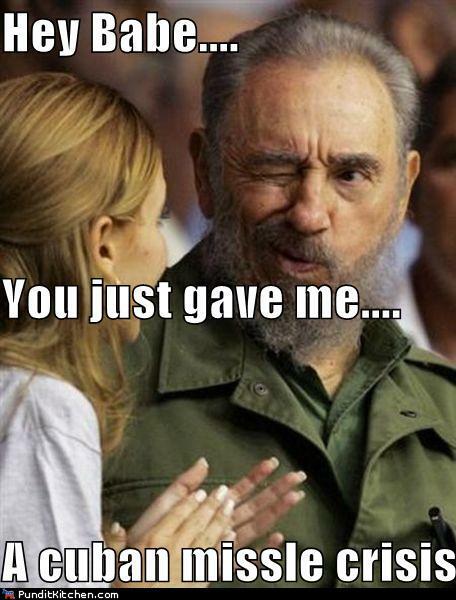 According to Lorenz, when Castro learned of the plot, he handed her his gun and challenged her to shoot him… she couldn’t even do that. If only things worked as well for the CIA as they always seem to for James Bond, thanks to gadget wizard Q. The CIA brainstormed such spy contraptions as a hypodermic needle inside a pen, with the hopes someone could get close enough to prick Castro and inject him with deadly toxins and get away with it. Speaking of deadly bacteria, there were also plans to give Castro an infected handkerchief, more commonly known as a snot rag. If they couldn’t kill him, the American government figured they could at least take him down a couple pegs and taint his image with Cubans. First, they strategized destroying his trademark beard with thallium salt, hoping this would make him look weak to citizens of the republic. Plans were also concocted to fill a radio station he was appearing on with LSD through an aerosol spray, hoping he would embarrass himself to the audience and lose their trust. 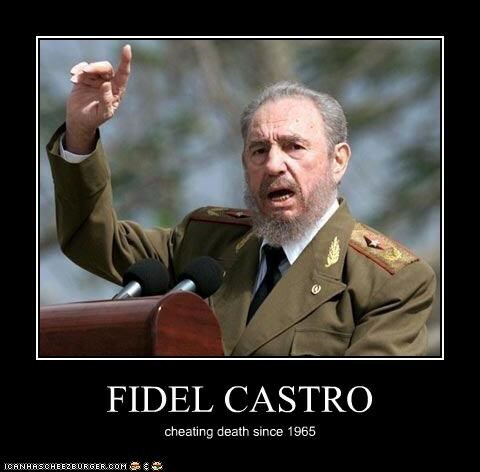 Castro once joked about the assassination attempts: “If surviving assassination attempts were an Olympic event, I would win the gold medal.” If you have a clever way you would have used to eliminate the former Cuba leader, share it below. It can’t be any worse than some of the stuff the CIA and others actually tried! 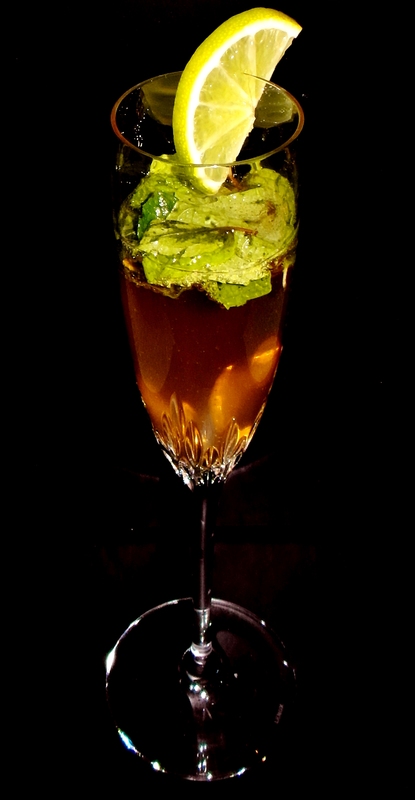 I have written before about my dislike of Champagne, but this recipe may change my wicked heart. I love Mojitos and it was fun to have the bubbles associated with Champagne as part of the traditional cocktail. The sweetness level can be changed with how much Simple Syrup you choose to add. The group I sampled this drink with preferred little to no sweetness and enjoyed the dryness of the cocktail.